Just like any other alternative to iTunes on the Mac, Ecoute has been around for a while. Since Apple shipped its very own music player and digital hub years ago, many developers have tried to come up with original solutions for all those who couldn't stand iTunes. And as iTunes grew bigger to accommodate apps, books, podcasts and just about anything you can put on an iPhone or iPod, thousands of users and even more developers started feeling the need of a minimal music player, again. What began as a hobby for a limited number of users ("let's not use iTunes for music") evolved into a real segment of a market willing to keep iTunes closed to listen to music libraries. And I understand the position of the users and developers that first thought about jumping out of iTunes: why would one need to stare at iTunes and all its features and options all the time, when you just need to listen to some music? In spite of iTunes becoming many people's less used music player over time, the apps that have surfaced in the past years that allow us to just play music are, in most cases, nothing but standalone iTunes controllers that strip away the clutter and focus on albums, artists and songs. They fetch a user's library, take the music out of it and display it into a minimal, sometimes non-existent, user interface. Coversutra, Bowtie: they are two popular iTunes controllers for OS X that have gained support for other features such as last.fm scrobbling and iOS remote streaming. But in the end, they rely on iTunes. So did Ecoute 1.0, and so does the just-released Ecoute 2.0. Ecoute is a well-known music player for OS X that plays music from iTunes, but doesn't require you to keep iTunes running in the background. It automatically finds a user's iTunes library file and takes content from there. It comes with a neat desktop widget for quick play / pause actions, but it's also got its dedicated interface. Ecoute 2.0 depends on iTunes, but it adds great value while giving you a reason to stay out of Apple's software at the same time. Ecoute 2.0 is a free upgrade for existing users and it's sold at the same price of the old version, which is $10. Just like you're probably used to if you ran Ecoute in the past, this app provides an alternative view of music stored in iTunes, but offers you the possibility to check on Movies, TV Shows and Podcasts as well. 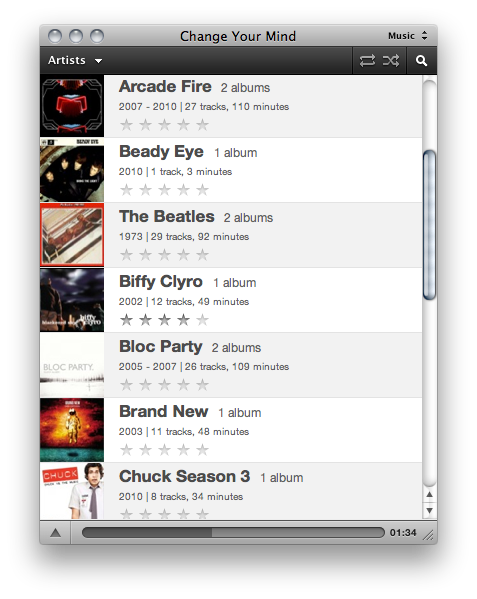 Personally, I prefer to browse my movies and podcasts in iTunes, so I gave Ecoute 2.0 a spin as a music player. After all, that's how I used the first version of the app. 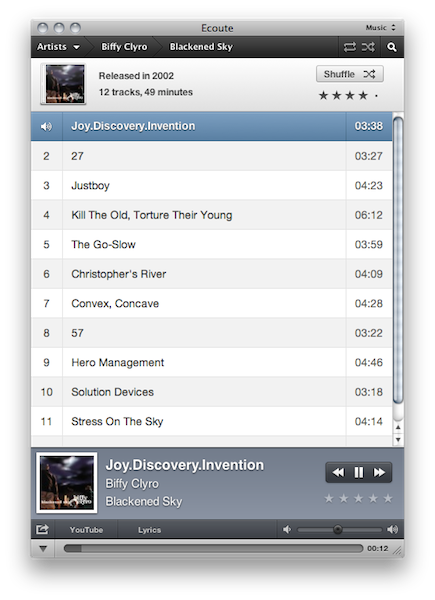 And admittedly, Ecoute 2.0 is a fast, beautiful and lightweight music player. On first launch, the app found my iTunes .xml library file but couldn't load it because I have a symbolic link pointing to it through Dropbox. Guess the developers weren't prepared for users with such tricks to fool OS X and Apple. But it wasn't a big deal anyway: I just manually opened the .xml file from Ecoute's Open menu and the app loaded my library in 2 seconds. The main screen of the app is an iOS-like list of artists you can scroll through to get to the music you need. Each artist has an album artwork, and Ecoute displays the number of albums, years and ratings as well. Like I said it looks a lot like a typical iOS list, but it fits well on the Mac. Actually, if this is the kind of iOS "inspiration" we're going to see with Mac App Store, I think we're good. Of course not all designers will be able to replicate Ecoute's beautiful pixels, but this is the path to follow. Yes, Ecoute has a nicely designed interface that makes looking at it a pleasure. There are several other little touches in the main screen worth mentioning: first off, you can reveal a "now playing" menu at the bottom of the window that displays artists, album, song, rating and buttons to play and pause. Together with these standard actions, there's an additional bottom bar to adjust volume, open the lyrics overlay, browse Youtube related videos in a standalone window and launch the sharing menu. Ecoute 2.0, in fact, allows you to share the songs you're listening to on Twitter and Facebook (you'll have to authorize the services in the app's preferences) and it pre-populates the sharing window with a message made of "I'm currently listening to" artist + song. It also automatically inserts a link to the song on Groovershark. Pretty cool. In the settings, you can activate scrobbling to last.fm and turn on support for Growl notifications. Other things I like about Ecoute's redesigned main screen is that when the now playing section is closed, the title bar of the app displays the song's name. It's a clever implementation that saves pixels and it's useful. Same applies for the actual bottom bar, which contains a progress bar. You can decide to organize the main screen by artists, albums, genres and so forth. What's cool is that once you click on an item (say, an artist) and you're brought to an album's view, you can go back to the previous page either by clicking on the breadcrumb navigation elements at the top or with a three finger gesture. Just like in Tweetie, for example. Ecoute 2.0 comes with a rich selection of keyboard shortcuts to choose from and customize -- I particularly appreciated the ones to show / hide the app and jump directly to the search page. As for Ecoute's desktop widget: it's nice and you can design themes for it (until the official Theme Center launches, you can find some themes here), but I'm not really huge on these desktop controllers. I prefer to invoke the app with my keyboard shortcut or just look at the dock icon if I need to quickly check on an album artwork. Another neat functionality you can't find in other similar iTunes controllers and Ecoute's developers implemented in the desktop widget, too, is right-click support: on the desktop you can right-click on the album artwork to open a contextual menu with all the songs from the album you're listening to; in the main screen you can click on any album or song and choose "play next". Other song shortcuts can be accessed from Ecoute's menubar item which, as you can guess, can be set to hidden in the Preferences. For those worries about the media buttons on Apple's keyboards: yes, they work with Ecoute. From a user's perspective, Ecoute 2.0 is the perfect update: it's free for existing customers, it costs 10 bucks, it's packed with functionalities and navigation options, it looks beautiful and it's even customizable with desktop controllers themes. It's got support for Apple's remote, it's more social than before, it can sync metadata information such as play count back to iTunes. Ecoute 2.0 is a solid and elegant update. It's full of sweet tricks and shortcuts that are still nowhere to be seen in iTunes -- it works just fine. I can't find a single element in this new version of Ecoute that made me think "Well, this could have been better". Ecoute 2.0 is, right now, the best minimal alternative to iTunes you can have on a Mac. Hands down.